Saturday, November 8th, 2014, at 4 p.m.
“Trois eaux-fortes” for piano, by Liyang Zhu. Saturday, December 27th, 2014, at 3 p.m.
“Echos dans la vallée”, for violin, clarinet and piano. 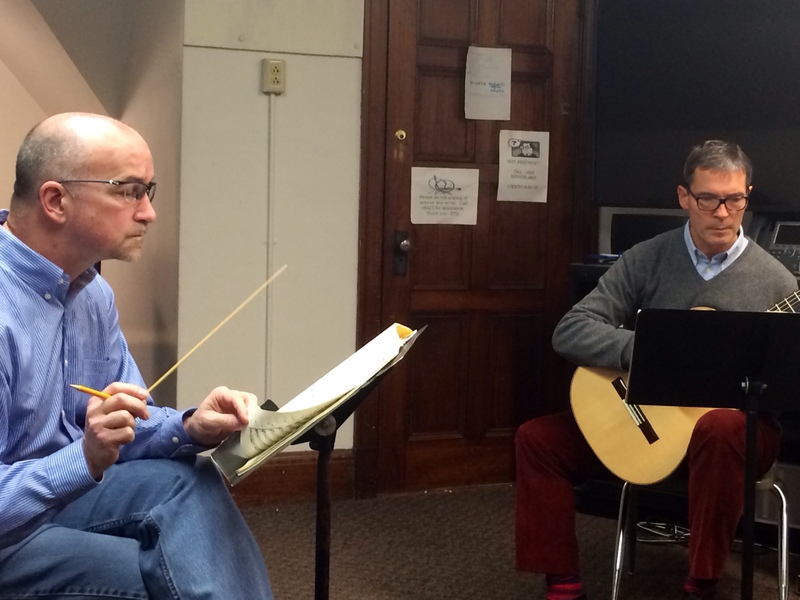 Sunday, February 22nd, 2015, at 4 p.m.
“Balance” for guitar, by Jonathan Lemarquand. 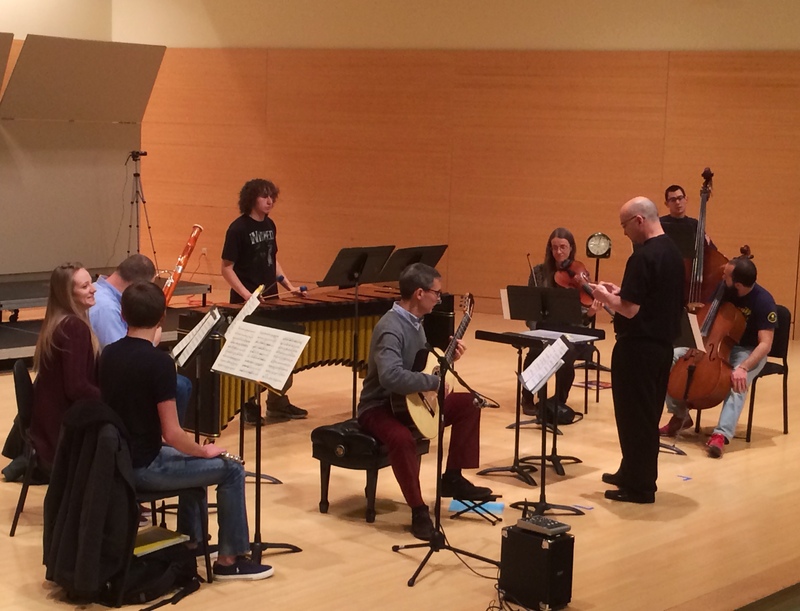 Sunday, March 1st, 2015, at 7 p.m.
“Des fleurs en forme de diamants” for guitar and 7 instruments, by Olivier Chassain, guitar, and musicians from the Webster University Chamber Orchestra conducted by Paul Davis. Tuesday, March 3rd, 2015, at 7.30 p.m.
“Trois eaux-fortes”, n° 2 Suspendu, and n° 3 Contrasté, for piano, by Christine Marchais. Tuesday, March 17th, 2015, at 8.30 p.m.
“Trois eaux-fortes” for piano, full version, by Christine Marchais. Saturday, March 28th, 2015, at 8.30 p.m.
“La houle à l’assaut des récifs” for cello solo, by Aurélienne Brauner. “Regards sur la création musicale contemporaine” : presentation of documents on Edith Lejet. Tuesday April 7th, 2015, at 8.30 p.m.
“Gravir” for trumpet and piano, creation, by the Liberta Duet: Antoine Candela, trumpet, and Christine Jeandroz, piano. Compulsory piece for the students of CEM level (end of second cycle). Compulsory piece for the students of Master 1. Compulsory piece for the students ending the 3rd Cycle. Saturday June 6th, 2015, at 4 p.m.
Concert by the class of Harp: Concert-reproduction of a Master-Class by Frédérique Cambreling, Ghislaine Petit-Volta is the teacher. "De lumière et de cieux embrasés", by Diane Ségard. Delivery of a medal to celebrate 50 years of présence at SACEM (Société des Auteurs, Compositeurs et Editeurs de Musique). Tuesday June 30th, 2015, at 7.30 p.m.
A Japanese CD of to-days’s French music was issued : “France Now”. it is a piano recital by Aska Iino, with a program of works by Murail, Boulez, Dusapin, Tanguy, Pesson, Jolas, Canat de Chizy, Lejet (“Fleurs d’opale”), Escaich, Amy, Campo et Mantovani. Référence : Camerata CMCD-2832. Member of the SACEM’s “Commission de la Musique Symphonique”. Member of the jury awarding study grants for 2015. Monday, February 2nd, 2015, at 6 p.m.
Charles Munch Lounge, 114 bis, boulevard Malesherbes, 75017 – Paris Concert dedicated to pieces composed by students of Composition (class of Edith Lejet) in collaboration with instrumentalists from Christine Marchais’ class (first sight reading). Tuesday, March 31, 2015, from 10 a.m. to 5 p.m.
Cortot Hall, 78, rue Cardinet, 75017 - Paris Master class given by musicians from the "Ensemble Alternance", in the form of a first sight reading concert with pieces composed by the students of Superior and Perfecting levels (classes of Michel Merlet and Edith Lejet).